DeansCards.com just received a complete 1933 World Wide Gum baseball card set. These 2⅜” by 2⅞” cards are also known as the “Canadian Goudey” set because some of these cards were printed in English and French. The World Wide Gum Company was the Canadian branch of the Goudey Gum Company. This unique set includes many of the biggest stars of the day and serve as a great example of Pre-War bilingual baseball cards. The 1933 World Wide Gum baseball cards were printed in two different variations: English only and French and English. Today, the French and English versions are slightly more expensive than the English only cards. The Goudey Gum Company was located in Boston, so at their peak of gum card manufacturing, they opened a factory in Granby, Quebec. Because World Wide Gum printed both English as well as English and French, it is suspected that these cards were sold in different parts of Canada based on local language preferences. 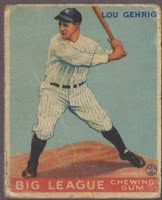 The 1933 World Wide Gum set checklist is complementary to the 1933 Goudey set. The first 52 cards are the same, but cards 53-94 are in a different order. 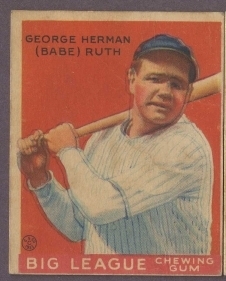 The 1933 Goudey set is also significantly longer, with 239 total cards. For most of these players, the 1933 Goudey cards are considered their rookie cards. The Goudey set is also much more difficult to collect than the World Wide Gum version. The individual cards are at least 25% more expensive than their World Wide Gum counterparts. The 1933 World Wide Gum has a strong emphasis on the stars of the day. 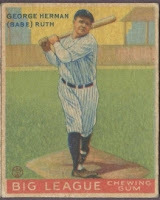 Babe Ruth has two different cards: a close up of the Babe in a batting stance (#93) and a shot of him swinging the bat in what appears to be an on-deck circle (#80). #55 Lou Gehrig is also featured swinging. The attractive, hand-drawn pictures of the players are mostly action shots, with a few portraits included. This set also includes cards that were oriented horizontally with the Big League Chewing Gum banner on the left side of the card. #60 Waite Hoyt is a good example of a different orientation from this set. The 1933 World Wide Gum baseball card complete set was difficult to find, especially considered the small market in which it was released. The basic idea of this set would be repeated, as demonstrated by the O-Pee-Chee sets, but it is still fascinating to see one of original bilingual sets.